I would not recommend The Railway to anyone! A friend and I hired the top floor for a party. We were told we had the place until 1am, had our own bar attender and had access to speakers and an amp in order for us to bring our own dj. I thought that's great deal, you can't go wrong. However the night was absolutely catastrophic! We told guests to arrive at 8pm, the dj arrived on time and was ready to set up. However there were insufficient cables, and faulty speakers. Therefore we were unable to have music at the party for the majority of the night. When we notified the managers of this issue and tried to seek help, they lacked concern, and did not know how to work their own equipment. We had to take the matters into our own hands, and source another set of speakers on the night, since the managers and the owner of the pub were not at all helpful, rude and ill-mannered. The music eventually started playing at 11:20pm as if this wasn't enough, I was then approached by a manager at 12:20am to let me know that everyone had to leave at 12:30am. After we were previously told that we had the venue until 1am. I was devastated as the music had only started playing an hour ago, so essentially the party had only started an hour ago. All in all I would not recommend The Railway, it was a very hostile, and unwelcoming environment. The managers and owner had a foul attitude, and was unwilling to help us from the beginning of the night. I will not be returning to The Railway and would advise everyone to stay away from it. As there are plenty more warm and welcoming pubs and bars in Clapham. The Railway is an excellent drinking hole. The toilets have all been revamped, and the upstairs is great for private parties. The Railway does great food, great music and is a great pub! The Railway must be up there with the top 10 worst pubs. Not only are the toilets filthy and staff rude and arrogant, but the management needs a major lesson in customer service. The Railway is a pleasant alternative in an area dominated by DJ bars and upbeat party spots. 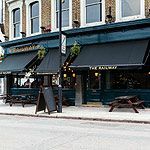 A relaxed, chilled out pub with a decent range of beer and lager on tap and a student vibe, it’s a welcome inclusion on Clapham High Street. 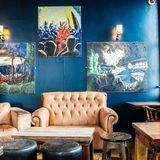 With simple decor, trendy artwork and a young, urban feel, The Railway is a break from the norm for Clapham. The inside is fairly unassuming with the usual pub tables and chairs. The obligatory plasma screen can still be found for anyone who wants to watch a bit of sport or music. 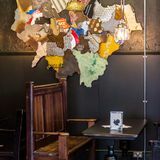 A couple of squashy sofas are dotted around the place but this is mainly somewhere to hang out without the pretentious atmosphere that can be synonymous with so many other London bars. There is also seating available outside for anyone who fancies an al fresco beer. An upstairs area with a separate bar is used at the weekends and is available for private functions. The Railway has a slightly studenty feel about it. Indie music plays in the background and sets the scene for an alternative left field atmosphere. This is somewhere for the younger drinkers in the area who like something a bit different. There is also live music on Sunday evenings, which is a crowd puller. 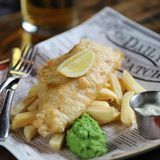 The food menu is kept fairly simple at The Railway but offers up good, wholesome food. Snacks and sharers cost from £4.60 for fish fingers in a floured bap with lime mayo. A sirloin steak with hot mustard and onion rings in a baguette is £5.90. Mains cost from £6.90 for an 8oz beef burger with Maris Piper chips. A rib eye steak is £10.50. Puddings cost from an incredibly low £2.50 for ice cream. Sunday roast is also on offer for £8.90. An unusual selection of Carling, Stella, Red Stripe, Aspal Cyder, Peroni, Grolsch and Staropramen are all available on draught with Aspal, Magners, Becks, Pacific, Chimay, Birra Moretti, Budweiser, Asahi and Duvel available in bottles. 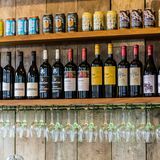 Wine is also represented with white wine available from £2.65 for a house Argentinean Chenin Chardon and a French Chablis coming in at £18 a bottle. Red wine is the same price for the house - an Argentinean Malbec with a nice Rioja costing £18.50 a bottle. Rose is from £13.50 for Alpha Zita (Italy), rising to £14.50 for a Pinot Grigio. If you like something a little more sparkling, Prosecco is just £15 and Verve Cliquot vintage is £45 a bottle. Different from many pubs found in this area, The Railway is a refreshing change from the funky bar scene that dominates Clapham. A nice, friendly place with a relaxing vibe.